Tonight, LIVE on the Spooky Boo LIVEStream we will talk about the Shadow People. 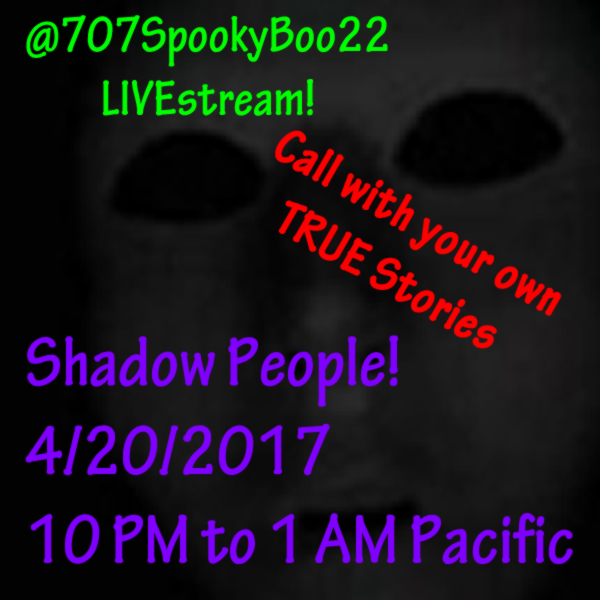 An hour of story telling from true and/or fiction stories and creepypasta and then I will bring in guests who want to talk about their shadow people or shadow men experience. Have YOU ever seen a shadow man? Show up tonight on the show! Details below. To participate on the show, email Spooky Boo at scarystoriesonvideo@gmail.com and you will be sent a link. Guests are allowed after 11 pm, after the first few stories are told. CLICK HERE TO WATCH THE SHADOW PEOPLE LIVESTREAM!